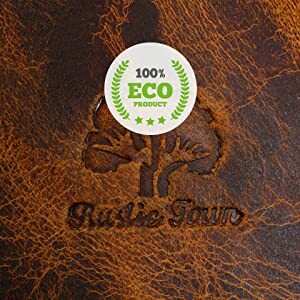 ✅ QUALITY GENUINE LEATHER: Searching for tough, sturdy duffle bags? Real leather is a must. Handcrafted by Indian artisans, ours is made from buffalo hide that can withstand all your adventures. ✅ RUGGED THROUGH & THROUGH: Indiana Jones would be proud to carry this heavy-duty duffle bag featuring break-resistant YKK zippers, stout brass fittings and a thick, premium cloth lining. 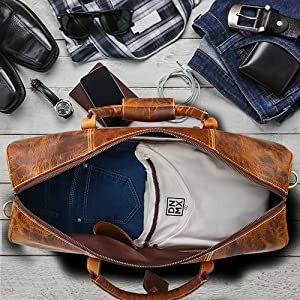 ✅ ROOM FOR ALL YOUR GEAR: Don’t let its small size fool you—your duffle bag is designed for packing efficiency with 2 exterior zip pockets, 1 inner zip pocket, 4 card slots, 2 pen loops, 1 mobile pocket and even space for your laptop. ✅ QUICK ACCESS POCKETS: Your travel bag has 2 quick access pockets. So that you can organize your cables and essentials in it, without the need to fumble around it. ✅ FITS OVERHEAD & UNDERSEAT: This underseat, carry-on luggage bag is ideal for air travel, business trips or excursions. Fits suit, shirts, pajamas, shoes, undergarments, shaving bag and devices. Looking for a step above the ordinary duffle bag? Want something that’s stylish—but also sturdy enough to stand up to heavy handling? 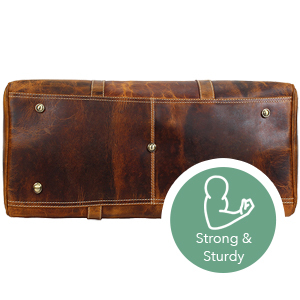 This distinguished-looking Leather Duffle Bag by Rustic Town sports a gorgeous design and natural marbling. You’ll be turning heads when carrying your genuine leather bag. With its spacious interior and smart organizational design, your weekender bag is built for short getaways or business trips. Many of our customers report that it’s suitable as a carry-on for flights (but check with your airline to find out their specific guidelines). Bags made of synthetic materials tear and wear out easily. Pick this one up and you feel the heft that assures you it’s made of thick, rugged hide that endures plenty of handling. You get nearly the same strength as full-grain or top-grain leather, but with a lower cost. This under seat, carry-on luggage bag is ideal for air travel, business trips or excursions. Fits suit, shirts, pajamas, shoes, undergarments, shaving bag and devices. 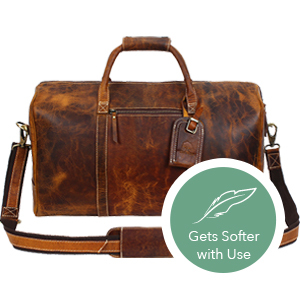 You’ll love the supple, organic feel of your bag’s authentic cowhide exterior. Even more, you’ll appreciate that it gets softer and more attractive with every use. You can feel good about buying a product that’s sustainably sourced and produced. 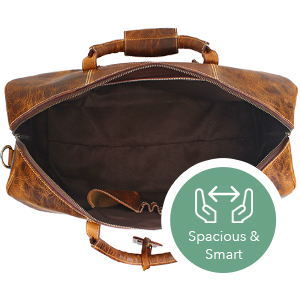 Our natural leather duffle bag is more Enviorment-friendly than bags made from synthetics. This item is produced using fair trade practices. Your purchase helps keep talented Indian artisans employed and supports the centuries-old leather making trade. Rustic Town does not use hide from animals killed solely for that purpose. Instead, our cruelty-free leather is sourced from animals used for food.